What happens when you mix a woman who has a passion for helping children, with a circuit riding pastor in rural Montana - especially when they "collide" in a small town? You end up the love story found within the pages of "Love Finds You in Lonesome Prairie, Montana," the first novel created by the writing team of Tricia Goyer and Ocienna Fleiss. Set in Lonesome Prairie, a town that existed during the 1800s, in western Montana, the book focuses on the relationship which develops when Pastor Isaac Shepherd meets up with Julia Cavanaugh, a street smart woman from New York City, who accompanies a group of orphans “out west” to their new homes. Fleiss and Goyer decided to create a circuit-riding pastor as a key character for a variety of reasons. “I've always thought circuit pastors were interesting,” explained Fleiss. “They sacrificed a lot to take God's Word to the frontier, and I wondered what it would be like to never be in one place for long. The pair based Isaac’s character on a real person. The pair decided to center the book in Lonesome Prairie, at the suggestion of their publisher, Summerside Press. After “Googling” the location, the pair discovered the town’s former site was located approximately four hours from Goyer’s home, and now primarily consists of farm land and a small lake. “There’s not much out there about it, since [the town] doesn’t exist anymore, but that made it more fun,” Fleiss said. Goyer and Fleiss decided to team up, after Fleiss volunteered to read and edit/critique Goyer’s six World War II novels. Initially, the pair approached Summerside Press to write a novel, set during World War II, for the “Love Finds You” line. It was put aside, temporarily, and replaced with their first joint effort, set in Lonesome Prairie, Mont. The pair is currently working on their initial idea, a novel featuring a woman named living during World War II. “Love Finds You in Victory Heights, Wash.” will be a future release by Summerside Press. Fleiss said the process of writing a book together, was different, because as an editor, she would only see Goyer’s manuscripts after the first draft was completed. Working together, explained Goyer, allowed them collaborate beginning with the research and planning stages. One of the key historical story lines is that Julia traveled to Montana on an orphan train. Fleiss said people used the trains to get children out of dangerous cities. “The children were often abandoned to the streets in the midst of all kinds of crime and poverty,” she explained. “The alternative was for the children to get jobs in the factories. They often worked for long hours, doing tedious, dangerous and damaging work, for very little pay. I picked up this novel, after a particularly hectic day at work. I was immediately drawn into the story, set in the late 1800s in New York City, and the open prairie of Montana. I loved the passion (I could almost see it in her eyes) that Julia - the main girl character had for the young children in her care. The characters created by Goyer and Fleiss seemed to jump off the page. This book is a fun, easy read - perfect for when you are tired of living in this century - and want to "step" back into a world without cell phones, iPods, laptops or texting. It might even make you realize what is most important - relationships with family and friends, along with a faith in God. Imagine her horror when she discovers that she's to be "delivered," too--as bride to an uncouth miner! But with no return fare, Julia's options are bleak. Read An Excerpt On-Line: Click here. Find It At Amazon: Click here. Want To Read More "Love Finds You" Books: Click here. The authors, Tricia and Ocieanna, have put together one humdinger of a contest for this blog tour! Enter the Fall in Love With Lonesome Prairie Contest and WIN a perty Montana Gift Basket! To enter, simply fill out the entry form at www.triciagoyer.com/contest.html, (then tell 5 or more friends about the contest)! The winner will be announced December 14th, just in time for an old-fashioned Montana Christmas. Giddy-up! Tricia Goyer is the author of twenty books including From Dust and Ashes, My Life UnScripted, and the children's book, 10 Minutes to Showtime. She won Historical Novel of the Year in 2005 and 2006 from ACFW, and was honored with the Writer of the Year award from Mt. Hermon Writer's Conference in 2003. Two of her books, Night Song and Dawn of a Thousand Nights, are both past winners of the ACFW's Book of the Year Award for Long Historical Romance. 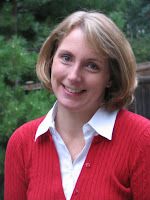 Ocieanna Fleiss is a published writer and has edited six of Tricia Goyer's historical novels. She lives with her husband and their four children in the Seattle area. Connect with Ocieanna on Facebook! Click here for details. It's an Oscraps Blog Hop!